As the local franchising industry continues to exhibit significant growth numbers this year, Globe myBusiness is upbeat on the opportunities for new and potential business owners to avail themselves of a franchise and also have the advantage to compete at par with counterparts from the ASEAN region. This was shared by the business unit of Globe Telecom servicing micro, small and medium enterprises (mSMEs), which is also the official business solutions partner of the Association of Filipino Franchisers, Inc. (AFFI). It echoed an earlier report by AFFI which mentioned that the Philippine franchising industry continues to register robust numbers, as home-grown franchises begin to expand to international markets. Globe myBusiness cites an AFFI study that the industry has grown by 20 percent this year, and expects the uptrend to continue with another 5 percent growth rate by yearend. This comes at the heels of the group’s member franchises sales of P63.4 billion for 2013. The trusted business advisor of Philippine mSMEs also noted that potential franchisors can leverage on AFFI’s projections of industry’s growth based on “the strong fundamentals of the economy and increasing development in the countryside.” A growing trend in the industry, it says, is the “development of non-food franchises which now account for 45 percent of the industry.” AFFI also noted that the Philippine franchising industry is currently dominated by home-grown brands that comprise more than half of the franchisors in the country. Globe myBusiness also sees franchising as a means to provide employment and increase the rate of job opportunities, based on the AFFI accounts, particularly from its Director for International Trade Affairs Erlinda Bartolome, that its members now have 19,312 stores in the country, which hire a manpower complement of about 135, 184 workers. “As the trusted advisor of our local mSMEs, especially those who are venturing into their initial foray in business, we are helping open doors for them through the potential and the promise of the franchising sector. As we have partnered with the leading organization in Philippine franchising, they can be assured that their business will have the backing on various fronts: from the communications technology front courtesy of Globe myBusiness, as well as the expertise and experience of AFFI,” said Martha Sazon, Senior Vice President for Globe myBusiness. With the ASEAN Economic Cooperation (AEC) fast approaching, Globe myBusiness forecasts vast prospects for new franchisors to expand overseas with the able assistance of AFFI, especially with the opening of the region’s capital and labor markets. 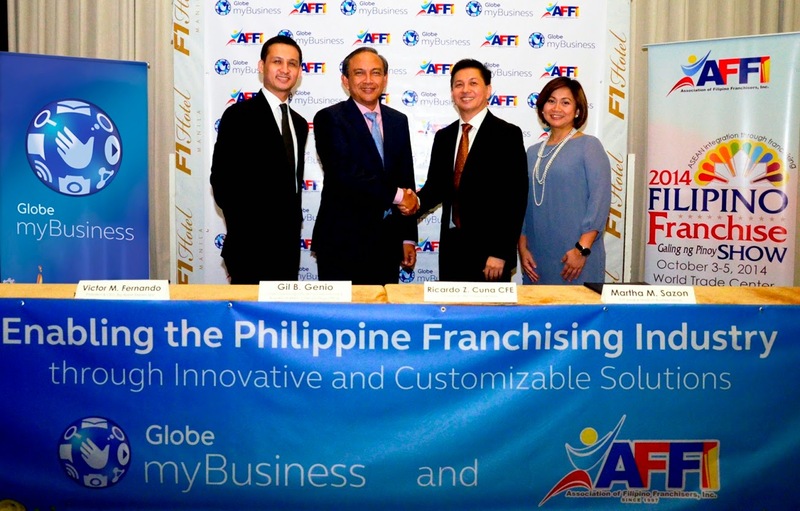 Recently forging a collaboration with AFFI, Globe myBusiness will play a major role in boosting the information and communications technology (ICT) capabilities of its members as the Philippine franchising sector gears up for the AEC. Franchisees under the AFFI umbrella can also look forward to harness the power of ICT as well as increase their business acumen as Globe myBusiness will provide industry thought-leadership know-how as a learning partner through mentoring programs, regional caravans and “Kapihan” events. Likewise, Globe myBusiness will assist AFFI members and their advocacies through promotions, advance information on offers, as well as processes streamlining through digitization.